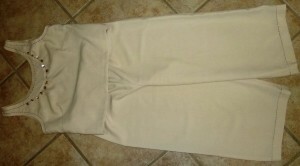 Home » Featured Flag » Back in the Traces – Wow! Two Ribbons!!! On September 23 I drove to Calgary to check out the results on two entries in the quilting and fiber art competition at the Calgary Creative Stitches and Crafting Alive Show and was ecstatic to find that I received a first on my Wearable Art entry – Memories of Arizona and a second on one of my memory quilts – The Fabric of my life. 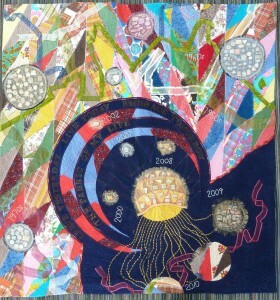 That’s the second ‘blue’ ribbon this memory quilt has received. This particular quilt is a ‘work in progress’ as it documents my life through fabric and findings from sewing projects and a collection of lapel pins amassed over a lifetime. Before mailing it off, I added pieces from the last couple of years. I still have a few to add for this year but it is starting to look ‘completed’. I will soon retire it. An earlier, much simpler, version of this quilt placed second in the Quilt Show associated with the International Plowing Match in Lanark County, Ontario, Canada. It also toured the USA in an earlier rendition. I don’t have a great place to photograph large work while we are traveling but here is a shot I took when the piece came home from earlier travels. to preserve memories associated with fabric and findings: Mixed fabrics, ribbons, organza, lapel pins from a personal collection, cotton batting. When preparing to move into smaller accommodation, my Mother presented me with a bag of fabric scraps that, when examined, I realized dated back to my first sewing projects. I decided this ‘find’ was too good to not use so combined these fabric pieces with left-overs from my own stash, and a few that date back to dresses – and my wedding quilt – from my Grandmother! Both the front and back of this quilt contain only fabrics that have personal significance to me. When I was preparing to ‘down-size’ I discovered a sizable collection of lapel pins, some dating back to my husband’s and my childhood, encompassing many of the organizations to which we have belonged and some from places we have visited. Today we travel extensively in a motor home and I have continued to build this ‘scrapbook’ as we explore the North American continent. The crazy patch portion represents the ‘crazy’ busy years of my life – Sunday School, 4-H, Junior Farmers, high school, university, and later, time spent raising a family and participating in farm organizations, volunteer activities, travel and a return to the workplace. The tunnel of circles represents the transition years, when we prepared for retirement, took short-term trips and started to let go of the past by sorting and distributing the accumulated trivia of a lifetime. The colors reflect the highs and lows of emotions experienced during this period of my life. The ‘golden’ end of the tunnel reflects my hopes for a simpler, more peaceful lifestyle in retirement, now overlaid with the busy reality of retirement on the road, splitting our year between visits to the home areas of a son in Calgary and a son in Phoenix, with occasional visits to eastern Canada to visit other family members. The quiet lower area initially represented the hoped for peaceful retirement with occasions of busyness, but is quickly filling with the reality of our new lifestyle. 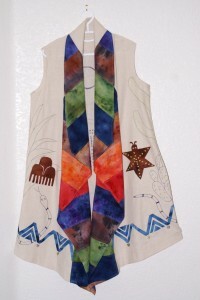 My Wearable Art entry ‘Memories of Arizona’ was inspired by my winter home, near a son who lives and works in the USA. 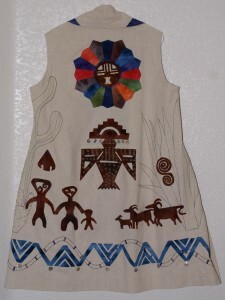 I have been interested in rock art symbols for many years – I managed to include some Native Studies courses in my degree program – and decided to use that theme for a ‘hot weather’ vest and then added a simple top and culotte with similar bead and stitching embellishment to wear under the vest. How beautiful Diane. Good for you with the ribbons. Thanks for telling us of all the symbolism.